In our Telugu Film Industry mass movies are well received. Whenever a mass movie release. single screens are mostly housefull boarded. Boyapati Sreenu, who makes mass movies is coming with Stylish Star Allu Arjun in the name of “Sarainodu”, produced by Allu Aravind under his Geetha Arts banner. Let’s see how it works on us! Ghana (Allu Arjun) is a guy who is a useless and waste fellow in the eyes of his caring and loving father. He settle cases in his violent way, which comes to Sripathi (Srikanth), a lawyer. He falls in love with MLA (Catherine Tresa) of his area, whom he met at a traffic signal. He follows her and makes her falls in love with him over the course of time. His family members agree to marry him with MLA. But MLA, puts a condition to Ghana over his quarrels. When he is about to promise that, Mahalaxmi (Rakul Preet Singh) appears and asks Ghana to help and rescue her from Ghana’s (Adhi Pinisetty) gang, whom Ghana hate for his deeds. Who is Dhanush?? Who is Mahalaxmi?? What is problem between Ghana, Dhanush and Mahalaxmi?? forms the rest of story. 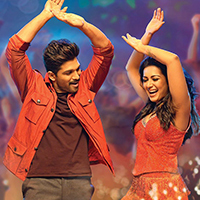 Allu Arjun is terrific in his role. He carried whole movie on his shoulders. He pulled of his mass role with super conviction. Adhi Pinisetty is ruthless in his terms of performance as a ruthless villain in the name of Dhanush. Boyapati made him a complementing villain for Allu Arjun. Catherine Tresa is average in her role. Rakul Preet Singh is a bit more on emotion in her role and performed accordingly.Rajeev Kanakala is fantastic in his role. Annapurna as Allu Arjun’s grandmother is nice. Jayaprakash, Srikanth, Brahmanandham, Prudhvi, Sai Kumar, Pradeep Rawat, Jayapraksh Reddy, Adarsh Balakrishna, Surekha Vani, Vidyu Raman and others are good to the extent of the role they are given. Story of the movie is routine. Screenplay is mediocre and is gripping at places. Dialogues are okay. Songs composed by SS Thaman are well received by audience. They are catchy and created waves. His background score is superb and elevated to a mass level. Cinematography by Rishi Punjabi is nice and visuals are treat to watch. Editing is good, but should have chopped some scenes out. Work of editor can be experienced in intro scene of Allu Arjun itself. Stunts and action sequences composed by various masters are fantastic and will be well received by masses and are of Boyapati mark. Production values of Geetha Arts are super rich. Movie begins in Boyapati’s mass formula followed by well conceived Allu Arjun’s introduction in which action movies are well choreographed backed up by rich visuals and nice edit pattern. This half goes in a formulaic screenplay with a comedy scene and a love scene with songs at regular intervals. Screenplay is a big let down till the court scene and from the court scene it gains momentum. Fight scene after court scene gives much required elevation to the movie but “It’s a private party” song which comes after this acts as a speed breaker despite it’s well composed moves. Interval block is purely a mass show of Allu Arjun in regular Boyapati’s location, a temple and his trademark heroic dialogues. This half is average with its mediocre screenplay. Second half starts with a flash back. There is no change in the screenplay which went awry in the first half of the first half itself and and gained momentum in the latter half of first half and go into its regular awry way in second half. This movie is a oora mass commercial entertainer from Boyapati Sreenu with Allu Arjun which has its pros and cons stuffed together. Below average second half and it’s last 30 mins, mediocre screenplay are spoilers of the movie. To sum up, it’s a Allu Arjun’s Oora Mass Show! !